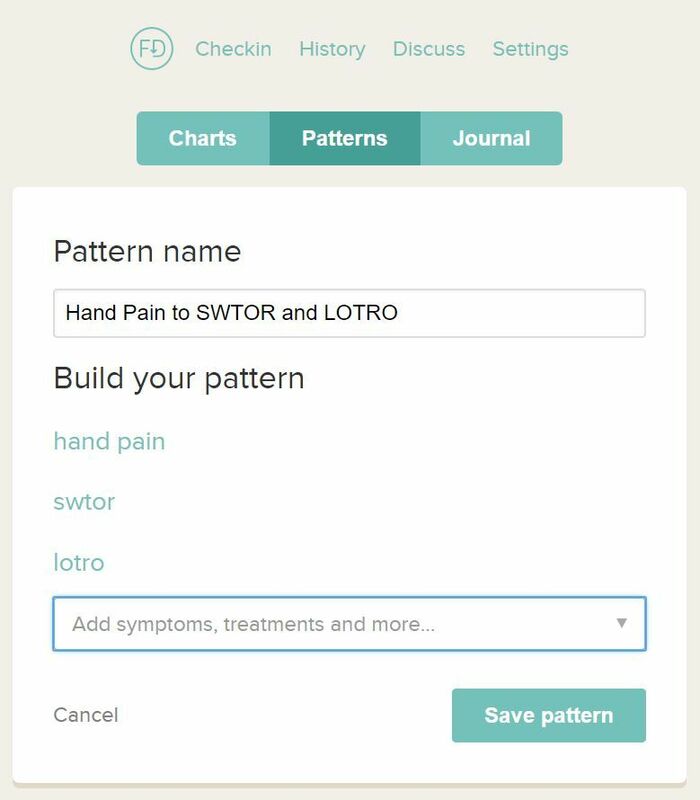 For years I had been meaning to either create a spreadsheet or write my own basic applications (I’m a former web software programmer) to track the symptoms ofmy Fibromyalgia. Doing so could help me to find patterns, or external inputs that lead to worse pain, or worse fatigue. 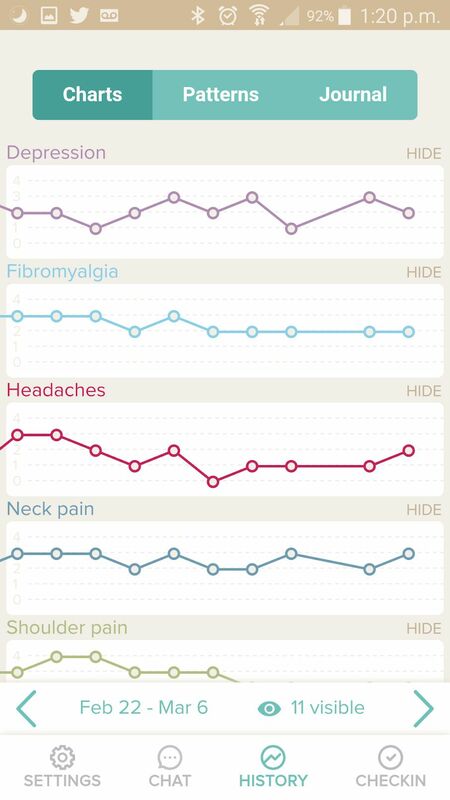 If I could track my Chronic Illness this way, I thought, then I could look at what changes I needed to make to reduce the effect of Fibromyalgia on my life. But I never got around to making it. So when I discovered FlareDown in my phone’s app store, I had to try it. Here is an honest FlareDown Review, with its features, advantages and drawbacks, so you can decide whether it would help you track yours, or even a friend or relative’s illness! 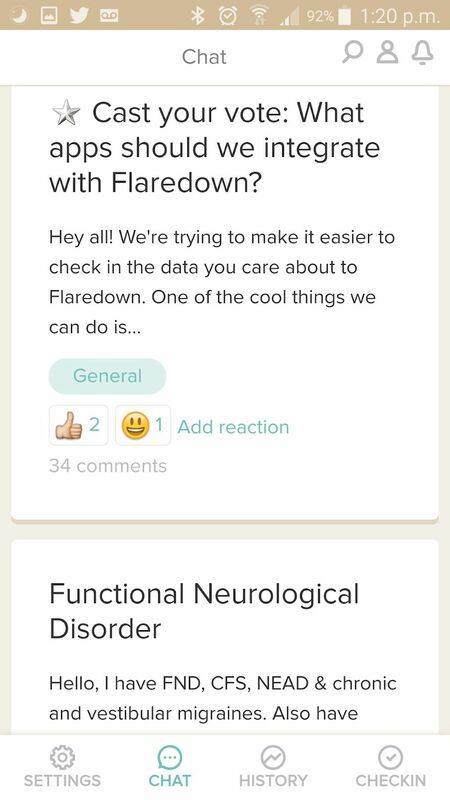 FlareDown is a highly personalisable app that allows you to track your illnesses or conditions, symptoms, treatments and other factors. 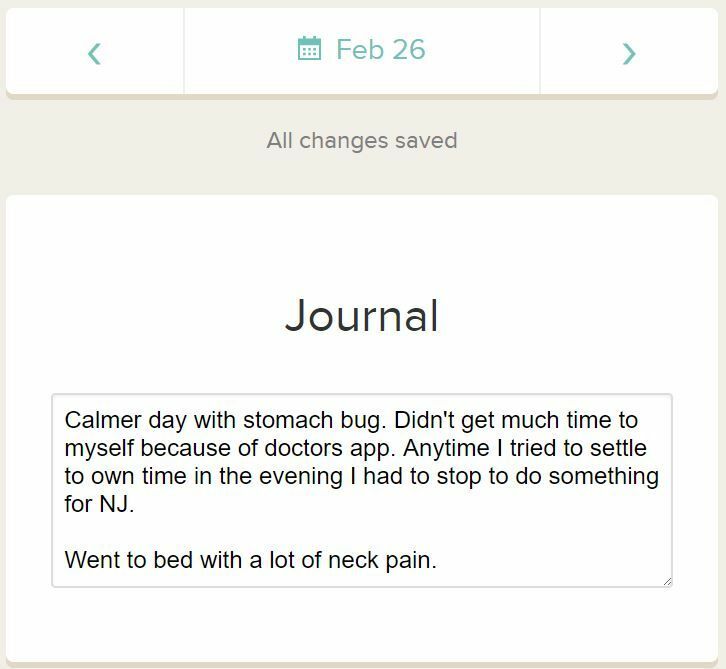 Each day you can Check In and enter that day’s information, allowing you over time to develop a greater understanding of how your health fluctuates. FlareDown is a free app and a website (or ‘web app’ if you want to be technical). The actual app – in my case my Android SmartPhone – is really just a ‘wrapper’ which holds the website inside of it. This means you can update your settings, or check in, on your device or your desktop/laptop and it will update everywhere at once. I’ve also provided the iPhone/Android download links here. FlareDown starts a bit like a blank canvas. You will need to add your conditions and symptoms yourself. Some of these may be suggested to you from their database, but you can add any of your own at any time. It’s important to note that you don’t have to use all the tabs – just use the ones that will be helpful for you. So, for example, I don’t use the Treatments tab, or the Food section inside the Health Factors tab. 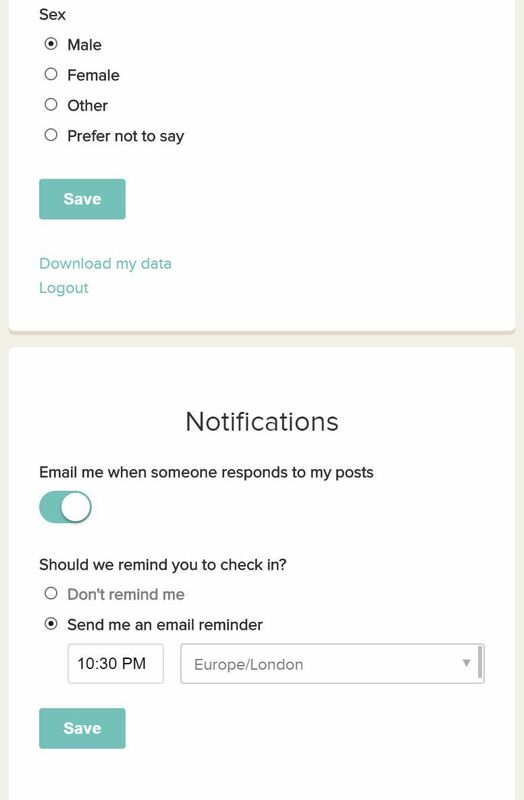 The first tabs inside the app (or on the website) are Conditions and Symptoms. Sometimes it can be hard to decide if something is a condition or a symptom, but you decide that. For example, I have chronic fatigue as a result of Fibromyalgia but I haven’t been diagnosed with Chronic Fatigue as a separate condition, but you might have had. So you decide which are symptoms and conditions (you can add to these later if you want). Once you’ve added a few, you then rate them on a scale of 0 – 5 as to how active that condition or symptom has been that day. As I am mostly just on meds for Fibromyalgia now, and not really getting additional ‘treatments’ I don’t use this tab. But if you have regular medical appointments, or are trying a new therapy, then it may be helpful to see if you feel any different the day, or the day after, a treatment. Living with a Chronic Illness is more complicated than just the condition and its symptoms. Life can make it easier or harder to cope with your conditions. This is where the Health Factors tab is so useful. I don’t use the Food section, however the Tags section is very useful. Here you can add your own tags that describe other things from that day. As with the Conditions tab, as you add a Health Factor you may get suggestions. But you can add your own (and I have). Add as few or as many tags as you want, because FlareDown will let you re-use ‘Recently Used’ tags tomorrow to save you typing. What tags might you add? SWTOR and LOTRO: to see if there’s a correlation between which game I play and various symptoms. Half Day No Child: for days where my daughter isn’t at home for some of the day. Housework: how much does vacuuming the house affect me (quite a lot, but not every time). Blogging and Streaming: as both have an impact on my health, to see how much they do. It’s your life, though, so only add things that are useful to you. Each day you can add a short Summary about that day. Use it to describe, in sentences, things which will help you when looking back. 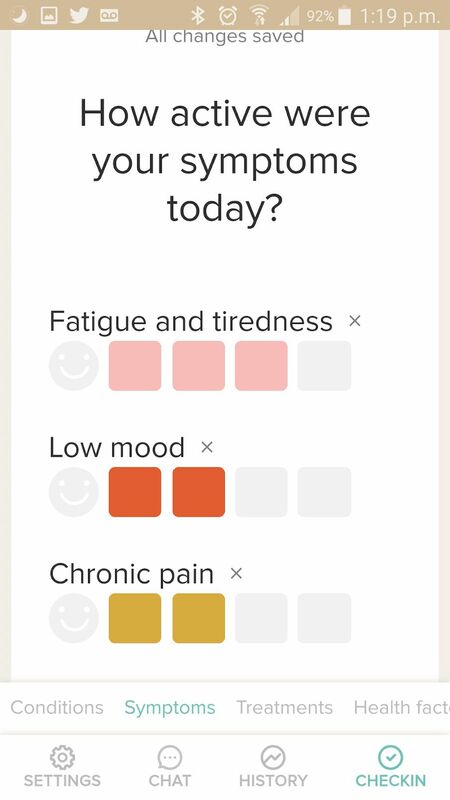 This journal feeds into the History tab, where your average of ‘how active were all your conditions today’ is shown next to that summary. This is a great feature as you can see how you felt (in words) against how manageable, or unmanageable, your chronic conditions were. This is where FlareDown becomes really interesting, and helpful, especially once you’ve got a few days and weeks recorded. 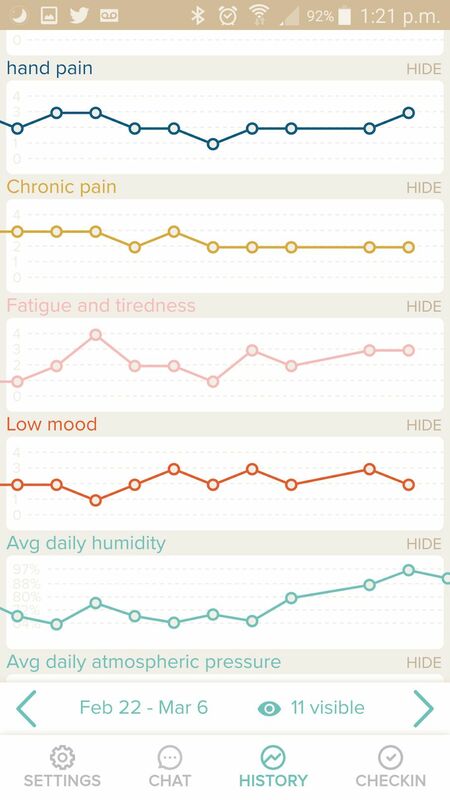 The pre-set graphs automatically populate from Conditions and Symptoms you have added. You can then see how much they fluctuate, or maybe, how little they do – i.e. it might be more stable and consistent than you thought! A word of warning – just because there is a pattern doesn’t necessarily mean that is the cause. Correlation does not mean causation. So here it looks like I can have bad hand pain with both my main games, for example. But I do other things in the day as well as gaming (believe it or not). 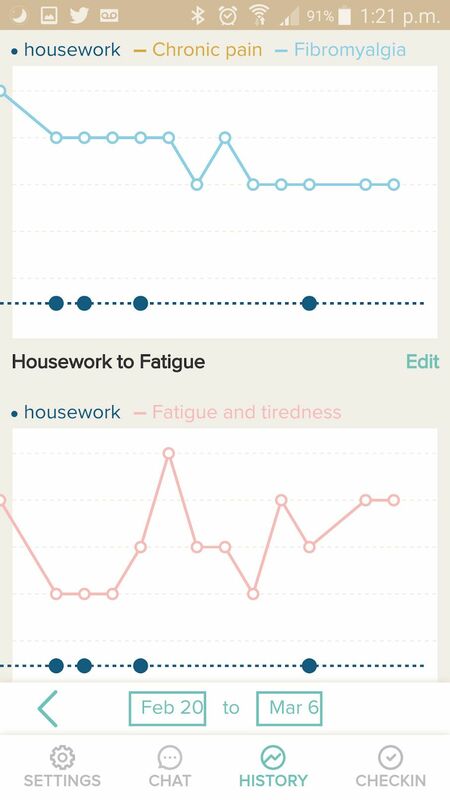 Data can help you understand your life better, but try to see all the factors from that day and how the day affected your Chronic Illness, rather than just one or two factors. Where FlareDown adds value is in its Chat tab. A mini-forum, Chat allows FlareDown members to add a new post and ask questions of other FlareDown users. It also allows you to respond to others – either with a text reply or with an emoji reaction. People seems to get helpful advice, ideas and sometimes just understanding from others, allowing people who may feel isolated due to illness to connect with people. As it is anonymous (you only post your FlareDown username), people can be themselves and they do not need to post any other personal contact details (and probably shouldn’t). But this is a powerful feature that shouldn’t be underestimated. If you want to look at your conditions and symtoms in more detail, then you can ask FlareDown to email your data to you. 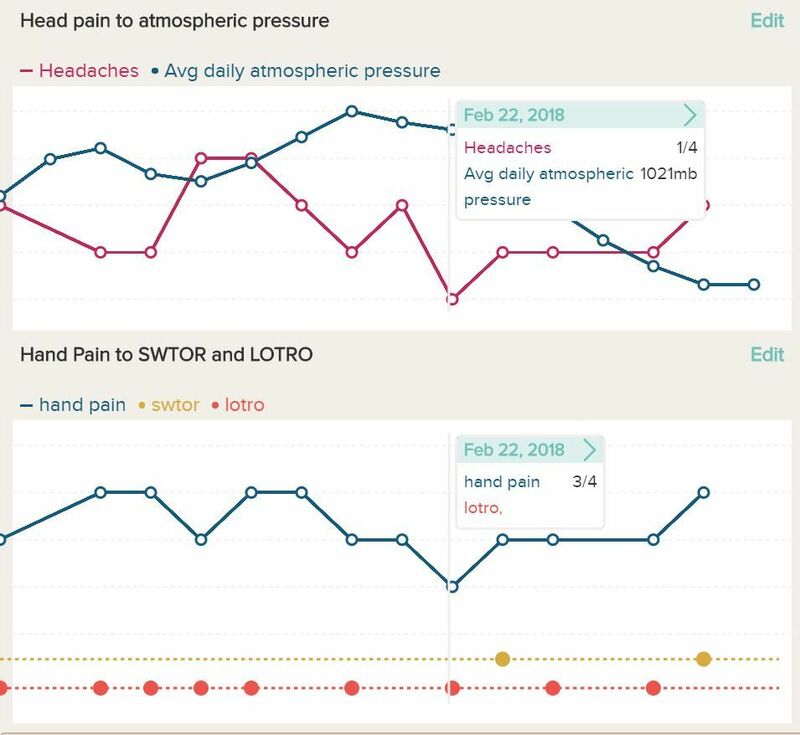 This can allow you to use Excel or Google Sheets (other spreadsheet apps are available) and begin to analyse a whole data of factors against your actual conditions, to see if a combination of factors helps or worsens your symptoms. 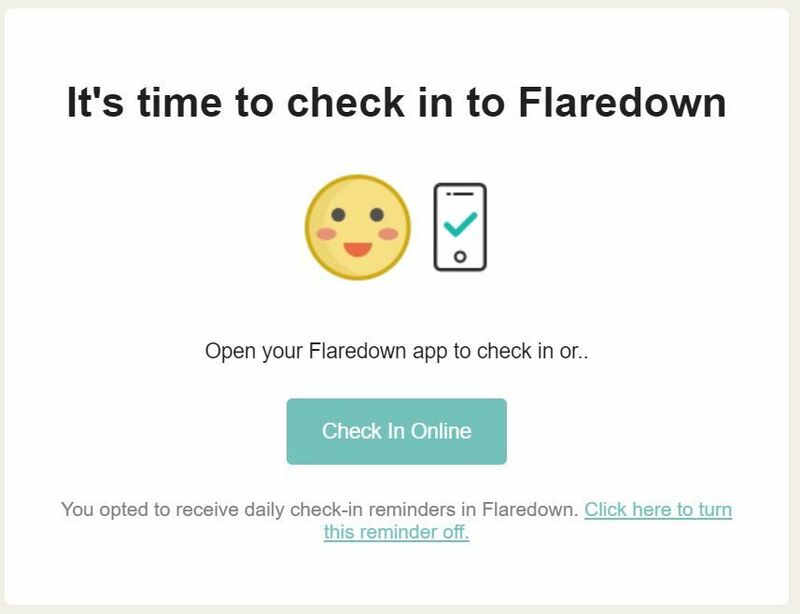 You can request FlareDown to email you a reminder to check in each day. This will be especially helpful for people who have a poor memory (like myself) or if you haven’t yet developed a habit of checking in. It is Free – both for the native app and the browser-based web app. You can use some or all of its features, making it personal to your life and health. having the mobile app means if your symptoms change during the day you can simply amend your rating at any point. Saves you having to try to remember to do it later! Your data is not stored on your computer or device. If you lose or break the device, or upgrade to a newer one, you can just sign in again and continue where you left off! Being able to tap into the Community can really help you reach out to others with your health problems, or people who may know about your condition or illness. Seeing Patterns over time, can help you understand how your condition varies as life changes day-to-day. Quick to Use: Checking in each day can take less than 5 minutes, so is not a huge time cost or effort. Need Internet Access: as data is not stored on your device, you cannot update your information on your device then sync it later. No Push Notifications: FlareDown can’t remind you to check in via a device notification. It has to be done via email. This is not a problem if you have your emails on your phone, it’s just that I don’t! The History tab is not designed for wider screens: per the screenshot below, if you look at the History tab, the graphs go from end to end of your screen. This makes it tricker to look for patterns. If you’re on a desktop or laptop, consider resizing the window of your browser to make the charts easier to read! 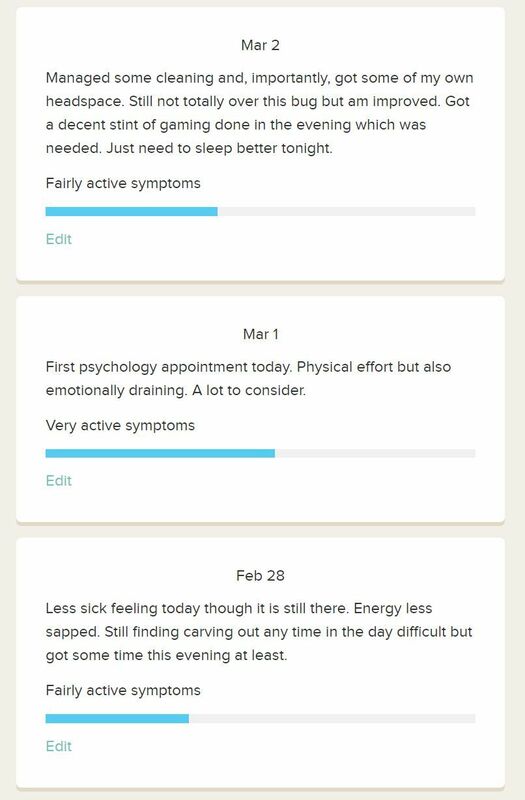 FlareDown is an excellent little app, which has really helped me to track my conditions and symptoms associated with Fibromyalgia. And I am still using it. Its flexible system means anyone with any illness can use it, so is very user-friendly. Its drawbacks really don’t compare to the massive advantages of the app. I would highly recommend anyone who has an illness or maybe someone who is a caregiver to give this app a try. If knowledge is power, the FlareDown gives you extra knowledge and insight to help empower you to understand, and maybe control, your illnesses better! I’m pretty sure there is a med-tracking app out there already, although I can’t remember if it’s free. I was asked to do a review once, but my wife manages my meds (and I use a pill box) and they’re the same every day so for me personally it would be pointless data entry. An app like this is likely to help someone though. I’ll see if I can find the name for you tomorrow! This looks like an excellent app. I’ll have to look into it. Do let me know how you get on with FlareDown if you get to give it a good whirl! Thank you for also sharing this, hope it helps people out! And thanks for the positive comments about the blog – I based it on a free theme but made all my own headers and things in GIMP – so the feedback is appreciated! Hey, just saw this post. I will definitely have to look into this. Do you know if it’s possible to have two people on the app? One for tracking me, one for Mom? Heya! In theory yes, you would just have to sign out as one user and sign in as another. As FlareDown’s app is just a ‘wrapper’ for their website, it’s the same as using a desktop/laptop browser. Hope this helps!